$39.225 million on 3827 screens. Since they created Ice Age in 2002, Blue Sky Studios has produced five more feature films. 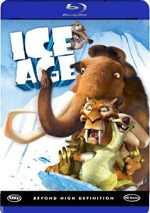 Two more - Meltdown and Dawn of the Dinosaurs - came as Ice Age sequels, while the other three left the prehistoric realm. These have shown Blue Sky to reliably produce successful – but not hugely so – animated films. 2005’s Robots performed the worst with $128 million, while Dinosaurs’ $196 million was the best and all the others fell between those two poles. The studio’s most recent semi-hit? 2011’s Rio, a bird-oriented romp whose consistent level of mediocrity reminds me why Blue Sky seems unlikely to ever rival Pixar. Smugglers capture a baby macaw and transport him from his South American home. The bird ends up in Minnesota, where he accidentally falls off a truck and lands in the arms of local youngster Linda (voiced by Sofia Scarpa Saldanha as a kid and Leslie Mann as an adult). She raises him as her own, and 15 years later, we meet the older – and very domesticated – Blu (Jesse Eisenberg). He leads a pampered life of luxury and doesn’t know much about regular bird activities like flying. Brazilian ornithologist Dr. Tulio Monteiro (Rodrigo Santoro) travels all the way to Minnesota to recruit Linda’s help. It looks like Blu may be the last male of his kind, so Tulio wants Linda to bring Blu to Rio so he can meet their female bird and try to save their species. She reluctantly agrees to do this, so they head to South America and Blu meets Jewel (Anne Hathaway), his female counterpart. However, she shows no interest in mating; instead, she simply wants to escape and live free. Since Blu loves his domesticated existence, he doesn’t want to go along. Matters conspire to force them together when smugglers capture them. However, they do manage to escape from this situation and find themselves out in wild – while chained together. We follow their adventures as they attempt to get along and stay alive, all while Linda, the smugglers and others try to find them. Though the opening to this review may lead you to believe otherwise, I don’t go to Blue Sky films with the intention to dislike them. Heck, I didn’t realize Blue Sky created Rio until I got into the theater. Actually, their two efforts prior to Rio gave me some optimism. 2008’s Horton Hears a Who! was surprisingly likable, and Dawn of the Dinosaurs turned into a fun flick with a slow start. Any progress these films displayed comes to a screaming halt with the utterly forgettable Rio, though I find it hard to pinpoint what exactly goes wrong here. On the surface, it seems to hit the right notes. It has a decent premise with the usual array of nutty characters, well-known actors, and a lively setting. So with all that, how can Rio seem so dull? I don’t know, but it really lacks any sizzle. I felt that way when I saw it theatrically, where the pacing felt leaden; I took a bathroom break at a point I felt was well into the movie and was shocked to discover only 30 minutes had passed. Perhaps because I know what to expect from the story – and perhaps because I didn’t drink a 200-ounce Coke Zero during my Blu-ray screening so I didn’t have to pee half an hour into the thing – the pacing didn’t seem so slow the second time through Rio. This doesn’t mean the film suddenly came to life and became more entertaining, though, as it remained relentlessly ordinary from start to finish. I think I almost laughed twice during Rio, though both near-chuckles followed close behind each other. Both occurred when slobbery bulldog Luiz (Tracy Morgan) donned a welding mask and offered disclaimers to the birds he attempted to free from their chains. And that was it. Otherwise the movie seemed to be laugh free – and largely free of much entertainment value. Again, it’s difficult to spotlight specific problems with the movie, as everything here comes across as completely serviceable; it’s not a movie you see and feel angry when it ends. No, you’ll likely feel no emotion at all, as the entire experience seems like a 96-minute exercise in ennui. Even with all the attempted adventure, comedy and music - Rio comes with a handful of actual song and dance sequences – the end result feels listless. It meanders along as it tosses attempted entertainment our way, but virtually none of it sticks. I can’t help but feel that we’ve seen all these kinds of characters and situations before – and better. Yes, Rio throws in a few twists, but it doesn’t include enough to make it unusual or special. Instead, it seems like something we’ve already experienced many times. I’m okay with movies that lack great originality, but they need to boast exceptional execution, and that doesn’t occur here. I view Blue Sky as a “C”-level Pixar. They attempt the same kind of product but lack the same skill. That ranges from writing to directing to acting to animation. While I’m sure all involved are as talented – or close – to the Pixar folks, there’s a certain magic absent from Blue Sky’s works; they simply don’t often mesh and come together in the same delightful way. I guess it’s semi-clever that Linda’s last name offers a nod to Fargo, but that’s pretty much where the inspiration ends. Rio offers a perfectly perfunctory animated adventure. It seems competent but never more than that. Rio appears in an aspect ratio of approximately 2.40:1 on this Blu-Ray Disc. Expect a stellar transfer here. With most of the action set in Rio – and during the extravagant Carnaval, as well – one would anticipate a dynamic palette, and that’s what one would get. The colors were vibrant and bright at all times, as they showed eye-popping vivacity. Blacks were deep and tight, while shadows appeared smooth and well-defined. This was an absolutely killer image. While not as strong, the film’s DTS-HD MA 5.1 worked fine for the movie. The soundfield tended to focus on the front speakers, though the rear channels kicked to life at times. These occurred mostly during the occasional action scenes; we got good movement for vehicles and all the bird flight on display. Otherwise, the nearly omnipresent music showed nice stereo dimensionality, and the track gave us a positive sense of place and involvement. The Blu-ray comes with a decent set of supplements. We get one Deleted Scene. Entitled “Fruit Stand”, it runs one minute, 29 seconds and show Blu and Jewel and Rafael as they sample local fruits. Presented in storyreel form, it’s a watchable scene but nothing memorable. For something interactive, we go to Explore the World of Rio. This gives us a map and lets us go to four different locations: “City”, “Jungle”, “Stadium” and “Beach”. Each of these provides a mix of options: “Video”, “Photo”, “Director Insight” and “Trivia Fact”. How does this work? When you click on any of the four locations, you’ll see the icons for the different options. Click on these to learn more. The breakdown: “City” gives us six trivia facts, two photos, three videos, and one Director’s Insight, while “Jungle” goes with five trivia facts, two photos, two videos, and one Director’s Insight. “Stadium” throws in six trivia facts, one photo, one video and one Director’s Insight, and “Beach” finishes with six trivia facts, two photos, two videos and one Director’s Insight. What content do these offer? Within “Trivia Facts”, we learn more about the Brazilian people and culture and locations. The “Videos” depict travelogue-style footage of Rio, and the “Photos” show the same kind of material. In the “Director’s Insights”, we hear from filmmaker Carlos Saldanha, producer John Donkin, actor Rodrigo Santoro, and cinematographer Renato Falcão. They tell us a little more about the various Brazilian locales. “Explore” won’t give you a detailed glimpse of Rio – and the format makes it slow-going to wade through all the material – but it does recap the topics fairly well. A few featurettes follow. Saving the Species: One Voice at a Time goes for 24 minutes, 49 seconds and offers notes from Saldanha, Donkin, Santoro, lead animators Lluis Llobera, Paul F. Diaz, Patrik Puhala, Amila Puhala, Scott Carroll, Jeff Gabor, Pete Paquette, Brian F. Menz, and Nick Bruno, producer Bruce Anderson, and actors Jamie Foxx, George Lopez, Jake T. Austin, Carlos Ponce, Jane Lynch, Jesse Eisenberg, Anne Hathaway, Leslie Mann, and Jemaine Clement. The show looks at cast, characters, performances and animation. It hits on a lot of good notes and becomes an engaging, informative piece. During the eight-minute, two-second The Making of ‘Hot Wings’, we hear from Saldanha, Foxx, Donkin, animation supervisor Galen Tan Chu, and actor/music producer Will.i.am. We learn a bit about the song and production number found in the film. It’s a fluffier piece than “Species”, but it has some decent notes. Boom-Boom Tish-Tish: The Sounds of Rio goes for 13 minutes, 30 seconds and features Saldanha, Donkin, Anderson, Chu, executive music producer Sergio Mendes, and senior animator Mika Ripatti. The show examines the movie’s music and dance sequences. This isn’t exactly an in-depth piece, but it throws in a reasonable amount of facts. Finally, The Real Rio lasts nine minutes, 31 seconds and includes info from Morgan, Foxx, Saldanha, Donkin, Anderson, Clement, Hathaway, Falcão, Santoro, Chu, Eisenberg, and art director Thomas Cardone. This follows the film crew’s research trip to Brazil and attempts to keep the movie true to those locations. I like the footage from the jaunt and think we get a good look at the flick’s attempts at authenticity. After this we find two Music Videos. “Welcome to Rio” is simply a montage of movie clips set to the closing credits’ tune. Taio Cruz’s “Telling the World” isn’t much more interesting; it mixes film snippets with shots from the studio. It does attempt to have characters interact with Cruz, but this is a token effort, so it’s a forgettable video. You can access different movie songs via the Rio De Jam-eiro Jukebox. It lets you choose from the flick’s five tracks and jump straight to them. It’s just a glorified form of chapter search. Under Postcards from Rio, we can make our own creation. It lets you pick from a mix of elements to generate a postcard. It runs a little on the clunky side but can be fun. To capitalize on the mega-popular game, we get a few features under Angry Birds Rio. A trailer (1:32) introduces us to the theme, while a “Nigel Mashup” (2:17) shows a Rio scene reanimated to include some Angry Birds characters; that makes it mildly amusing. Finally, an “Exclusive clue Video” (0:28) gives you a code to enter when you play the game; it’d mean more to me if I’d ever done so. The disc opens with ads for Hoodwinked Too!, Mr. Popper’s Penguins, and Ice Age: Continental Drift. The Blu-ray also tosses in the trailer for Rio. A second disc offers a DVD Copy of the film; this appears to be a full retail version of the release. 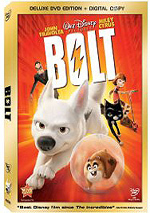 A third platter contributes a Digital Copy of Rio which will let you transfer the movie to a computer or portable viewing device. 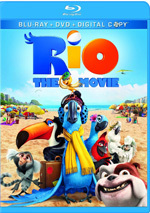 While Rio has all the elements to become a fun animated adventure, it never comes together in a satisfying way. Despite its vibrant settings and situations, it ends up as a surprisingly flavorless and generic film. The Blu-ray delivers excellent visuals along with good audio and a decent – though superficial – set of supplements. I’ve seen worse animated comedies than Rio, but I’ve seen better – a lot better.